Hello everyone, Chris here with basically a remake of a successful (not so much anymore though) RP over at GameFAQs Phantasy Star IV message board that I created called Another Phantasy Star RP (APSRP). This time however, it is essentially an alternate universe upon which is being recreated here in this RP simply called Chronicles Of Algo, or COA for short. Well the good thing about this is that we get to create the story ourselves. However, one fact should be known, this will take place ten years after the events of PSIV. This makes the timeline 2294. 2. This RP is not to be used as a way to get revenge on another forum user. If you have a grudge with another user, find another way to resolve your issues. 3. A character cannot be way too powerful without good reason. 7. If you join, we do expect you to post, in the event that a character disappears, expect them to be worked out of the stroy somehow or otherwise just ignored. A good example of this is that in APSRP there is technically a spaceship hovering just outside Aiedo. Last edited by Atlinsmere on Wed May 5, '10, 5:54 am, edited 2 times in total. The following will contains knowledge of what has happened for all those who wish to join COA but refuse to read the posts leading up to the events. I will mostly post the main events that occur and important facts in the order of which they occur. This may one day be changed to be more organized for easier reading. A hidden prophecy found in a music chip had this message. A battle shall occur. A great war began. During the year of the Rappy happiness shall end. Only a hero, who's soul is pure, shall vanquish the evil. Now gather your forces without delay. The prophet has spoken, Jakob Daze. A major battle broke out involving thousands of androids trying to put a stop to a Trey's Hunter mission which involved Neo Paseo. Many odd things occurred during this battle and the source of the android problem was found, apparently Neo Paseo was built near an underground factory that manufactured androids of many kinds, including close range sword fighters, mid range gunners, and long range tech users. Jakob Daze used a forbidden technique called Elemental Destruction (ED), it combines the elements fire, water, earth, and air for an almost godly reaction. All Allies are healed, all enemies destroyed, and everything looks good as new. The cost of this technique is energy depletion, and being put into a coma. ED can also only be used 5 times, Jakob just used it for the second time, being sent into a coma. The group decides to go see Trey's teacher who knew about other planets, including Earth, to see if they could find a cure for Jakob. So, using an experimental Hydrofoil (It's modified to fly) called Sylvina, the group heads to Uzo to see Trey's teacher. Other notes These are notes that may or may not be important, but may be interesting. -Neo Paseo - Built in 2285 AW, location not discussed. A city famous for it's shops, even more so than Aiedo. It's beautiful scenery is often ignored due to the business of the streets. Soon, a second Hunter's Guild will open, and will be located in this city. -Lazy Daze - A small radio shop in eastern Neo Paseo that is run by Jakob Daze. -Celieth's(name?) - a small shop/inn/tavern in eastern Neo Paseo that is run by Celieth Silverlake. Soon to be a Hunter's Guild apparently. Author's Note These are just my random notes for the fun of it. Note to self: buy more ramen. Last edited by Atlinsmere on Wed Jun 16, '10, 11:42 am, edited 4 times in total. [EDIT] Updated this post for easier access to my other character information. ~Clothes: Dark blue Shorts that extend slightly pass the knee. A black t-shirt, dirty black and grey sneakers that once seemed to be black and white. white ankle socks. ~Accessories: Black wristband on left wrist. 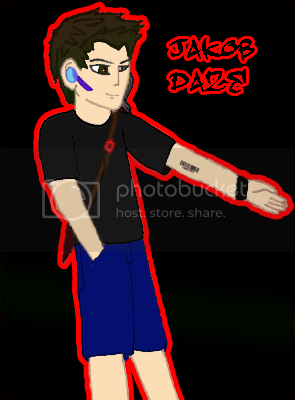 Character History: Jakob Daze, best friend is Skylar Spires. A genius from birth. Casted his first tech at the age of 4. He became the center of hate by many, but is liked by many more due to his genius. Joining the hunter's guild at an early age, Jakob has earned the title "Prodigy" due to his talents as a hunter and his precision when it came to taking care of missions. He is an ex-hunter but quit after a series of events that marked him as a threat and has since then fled to Neo Paseo. He makes a living by running a small radio shop in the eastern part of Neo Paseo. Other: He has a tattoo of a serial number on the inside of his forearm. Name: Charlie James Hunter "CJ"
~Clothes: Blue shorts with green palm trees, black muscle shirt, Dark green Motavian cloak that helps to conceal his face. Black fingerless gloves with dark green padding on the back (right glove is merged with weapon). ~Accessories: Black wrist band on with the word "FATE" on it in white on left forearm. 50lb Weights tied to ankles. A small necklace with an odd pendant. Equipment: Laser sword on left waist, dual ceramic knives hanging on right waist, Blood Axe that hangs off back, Laser Claw which is merged with his right glove, ceramic shin pads. Character History: Born and raised in Krup, he grew up in Krup as a delinquent despite the people around him trying to persuade him otherwise. Despite people thinking he was trying to just draw attention to himself, CJ just wanted to be alone. On his eleventh birthday, he ran away from home taking with him only a bandana and hunting knife. Upon his first encounter with a biomonster, a man named Geoff saved him and taught him how to steal to survive and fight with a sword. After two years with Geoff, CJ was awarded with his masters Laser Sword and necklace before vanishing the next day. Not knowing where to go, Charlie walked along until he came to a cave. Exploring this cave he came to a small town called Tonoe where a Motavian taught him how to use an axe for working fairly after he was caught stealing by a Motavian named Rori. After another two years, CJ had enough and stole a nearby axe, along with a Motavian cloak so he could sneak out of town easier. He ended up keeping the cloak due to the coolness from the heat it offered. After a year of travel alone, Charlie came across a mysterious hooded stranger who called himself Magnus. The hooded man taught CJ how to use a claw and gave him weights for his legs to help with speed and his green gloves . CJ continued to travel with Magnus until he vanished just as mysteriously as Geoff had four years before. With no where else to go, Charlie began traveling alone again until he was caught stealing by an ex-hunter named Jakob who taught CJ how to use knives properly for a month. After that, Jakob bid Charlie farewell and went on his way to open up a shop in Neo Paseo. After another year of traveling alone, CJ began having nightmares that kept telling him the same thing. Find Jakob. Other: According to what Charlie heard, he is thought to be dead by the residents of Krup. Last edited by Atlinsmere on Wed Jun 9, '10, 9:41 am, edited 3 times in total. Equipment: Modified Pulse Vulcan (can be switched between firing at one target, or multiple targets at a reduced damage rate). Can equip android skills (see below). Skills: Salve (basically the cyborg equivalent of Recover), Barrier, Medic Power, Spark, Warla, Flare, Tandle. Positron Bolt is currently equipped to her Vulcan. She can equip other android technology (sounds like I'm talking about my phone!) to her Vulcan, but only one at a time. Brigit was experimented on around the age of 19 and parts of her body (she has not revealed in detail which parts) were replaced with cybernetic ones. Her cybernetic systems constantly regenerate her organic parts, which greatly increases her lifespan. She has some enhanced abilities such as vision, hearing, strength and stamina, but outwardly she appears human. Her physical age is permanently 19-20 years old. It is estimated her actual age is between 200-300 years old based on documents found in Motavia Academy concerning an unnamed project towards the end of the Great Collapse meant to salvage what was left of Palman technology. She knows how to repair herself and is self-employed as an engineer and mechanic. It’s not a high demand job, but occasionally she’s called on to service the remaining electronic systems on Motavia and smaller equipment used by farmers and smiths. She keeps herself armed due to her drifting, but has never worked as a hunter or guardian. She's a great humanitarian, but will not normally allow others to know her on a personal level. Other: Can regenerate HP like androids. Can only learn techs up to gi-level. Res and Sar techs work on Brigit but only at half efficiency. Has a slot for a keytube at the base of her neck that opens an access panel that controls some of her human impulses. The key was stolen decades ago as a prank, and now Brigit has a few personality quirks and a smoking habit she'd really like to adjust. She's tried fashioning her own key, but has so far been unsuccessful. Important: It's not common knowledge that Brigit is a cyborg. One last thing: There is another cyborg that Brigit has been searching for. She has never met him, nor does she know what he looks like. She's not even sure he still exists. She is only aware that two cyborgs were created, one male and one female (Brigit), to test the effects of cybernetics on both sexes. The only identifying information she has is his human name. Will she ever learn her counterpart's fate? Last edited by Tanith on Thu May 6, '10, 11:56 am, edited 4 times in total. Out Of Character (OOC): Well normally I'd wait until at least one more person joins but I'm feeling impatient so I'll just start it I guess. Last time I just introduced all three people who joined in a single post and we played off that, but this time, I'm just gonna use my character only. Nothing grand either, just a simple introduction to bring him into the story. Jakob Daze sat, awaiting for the day to end as he tinkered with a broken radio, hoping to get it working again. Yawning, Jakob took a break from his work and stretched, looking out at the empty shop called Lazy Daze. At this rate, he thought, I might as well just close up shop and look around. ~Clothes: Wears a sleevless blue shirt with a thin light blue long sleeved shirt underneath, long red pants with a golden outline and a pair of worn black sandles. Character History: Celeith was born in the town of Aiedo where she grew up with Trey Ruglia and his sister Anise Ruglia, Eldrich Crash, and her adoptive brother Mathias. When Celeith was 19 she moved to Neo Paseo and opened up a small shop/inn/tavern for the local adventurers who pass through town. Celeith does not like battle, but she has a inner fighter inside her and it shows when she wields her twin swords Heaven and Hope. Other: She enjoys when Trey passes through town and stays for a few days and tells her of his adventurers as a Treasure Hunter for the Hunters Guild in Aiedo. "There's no smoking within city limits," the gruff voice of the pudgy, short-legged guardsman called to Brigit as she got nearer to Neo Paseo's main gates. Brigit rolled her eyes. I could take him out in under a second, she grumbled to herself. Instead, she flicked her cigarette and continued walking towards the city's entrance. "We also have a fire ordinance, Miss," the guardsman carped, nodding his head at the still burning cigarette resting on the ground. "Outside the city?" Brigit sassed. "It's for the whole county," he sternly replied. Brigit mumbled something about not knowing Motavians were now claiming entire counties. "Fine," she griped as she released a stream of water from her right palm, precisely dousing the cigarette. The guardsman's eyes grew wide. "How'd you-"
"Techniques," she interrupted, giving him a devilish grin and a hard whack on the shoulder as she passed through the gates. "You should learn a few," she called with her back to him, disappearing into the sea of pedestrian traffic. Algo was close to the horizon as Brigit entered town. It was also directly in her path to the shopping district, so she pulled down the shades resting on her head even though she didn't really need them. It was a force of habit, even some 200 years after receiving artificial optics. The city of Neo Paseo was bustling with activity. The streets were filled with merchants and travellers, a good day for anyone trying to make a quick meseta. "Welcome to Celeith's, if theres anything you need please let me know." Celeith said as two travellers walked through her door. The two brought some Dimates and Ceramic Swords. "Your total is going to be five hundred meseta" Celeith said. The male traveller handed Celeith the money, strapped the sword to his back and then left with his female friend. Sigh... There hasn't been alot of sales lately.. I wonder if I should close the shop down for the day and take a walk around town. she thought to herself. A hour passed and not one customer entered the building. "It looks like I'm not gonna make much money today. Guess I'll close up early." she said to herself. After flipping the Open sign to Closed, Celeith locked the door and made her way towards the town square. Although the main streets near her house were filled with people the sidewalk was completely barren, making it easy for her to manuver through the town. Celeith sat on a bench near the giant fountain at the town square, watching the little kids play and their parents enjoying conversations with each other. The wind picked up just slightly, creating a warm, yet cool feeling on her face. "Hey there Celeith, its been awhile hasn't it?" A familiar voice said to her. She turned around to see a friend standing behind her. Jakob got up and looked around his quiet shop, picking up a few different radios, testing his product. This would be a lot easier if I didn't have to hold these. Jakob thought as he grabbed onto an older model of Radio. An idea sparked into Jakobs imagination. He would create a hand free radio that wraps around the ear. However, it would require some parts that he didn't have laying around the shop. At least, that's he what he thought at first. He remembered his box of older, yet advanced technology that he stole from the Hunter's Guild since it peeked his interest. Walking into the back room he found the box. Opening it up he saw something which made him laugh. There was already a headset lying on top. But it appeared broken. Guess all that's left for him to do is fix it. Last edited by Atlinsmere on Thu May 6, '10, 11:21 pm, edited 1 time in total. ~Clothes: A gray T-shirt and short skirt, well-worn traveler's boots, and an elbow-length glove on her left hand (the one she wears her Claw on). Character History: Shalelu wasn't exactly wanted by her parents- she has been pawned off and foisted upon relatives most of her life. Of course, she doesn't exactly see it as a bad thing- Shalelu thinks it's "a perfect opportunity to meet new friends!" Simplistic as she is, Shalelu joined the Hunters' Guild to further her goal of travelling Motavia, "seeing sights and eating awesome food!" She's in Neo Paseo right now due to a lack of Meseta. Other: It's pronounced "Sha-Lay-Lou." And yes, she's... uh, not all that bright.